"Whiteley is a compelling figure: part artist, part charlatan, myth-maker extraordinaire, he died of a heroin overdose in 1992, aged only 53, in a country motel. So much of his work is trashy product for the cannibalistic art market that at once made and destroyed him, and yet his sublime gift for colour and line gave us some of us our most iconic paintings. Dickins, however, isn’t interested in moralising, nor in biography. What he has created instead is a poetic riff that recreates Whiteley’s restless imaginative excesses, a theatrical meditation on art, beauty and self-destruction." [read the whole review here]. While regrettably i have not seen the production (though would dearly love to), i was struck by the similarity of artistic intention between Dickins' play and my humble efforts in this evolving series. The notion of a work being a 'meditation on art' stayed with me. ... and i began to think about BW's love for Eastern drawing traditions, interest in Buddhism, rapture for Tai Chi (his sister Frannie says it was the closest he came to actual meditation). ... and i began to see his art works as Do-Zen, or moving meditations - the traces left by his body in meditative dance. 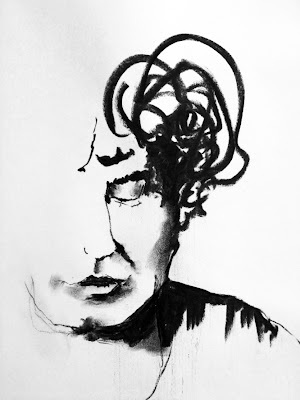 ... and i began to look for Brett Whiteley's Buddha nature. Thanks, Laura. Glad you like. Beautiful, serene, calming, meditative - this drawing/painting is all of those things. According to Buddha's teachings, all of us have Buddha nature (the good, the calm, the true, the pure) which we can tap into at any time (given some effort, of course). As in painting and drawing, the effort is worth it when the outcome is transcendence; and, Harry, you often reach transcendence in your work.